Back to the Future car at Virtual Reality showcase. Shaken Not Stirred had another busy weekend – first bartending a showcase event in Santa Monica on Friday, and then doing a wedding at the Mountain View Retreat in La Quinta on Saturday. I made hundreds of drinks at the two events and served several cases of alcohol. I guess I got my practice in, because I’m gearing up for a three day wedding event I have this coming weekend in Palm Springs. The showcase event was held at a historic building in Santa Monica which is now home to The Gateway Virtual Reality Showroom. They showcase new forms of virtual reality there. I was too busy to check out any of their demonstrations, but it all looked very cool. I brought another bartender with me and we worked two separate bars, serving over 200 people. Karma Tequila provided the tequila for the event and we also served the new light beer from Corona – Corona Premier, with only 90 calories. Guests said it was pretty good. They had a couple of food trucks pulls into the back parking lot to serve the grub, and they had a DJ on the scene. We served completely out of tequila and most of the beer by the time the night was through. The next morning I had to get up bright and early and head out to La Quinta, 120 miles away. I was not only bartending a wedding that night, but I had to do all the shopping too. It is an extra service I provide and charge extra for, but in some cases the host wants that convenience. I preordered most of the alcohol from Bevmo, and it was all waiting for me in La Quinta when I got there. The rest of the supplies I bought at Smart and Final, including the ice. The wedding was held at the Mountain View Retreat, where I have bartended before. I set up my portable bar and table under a veranda beside the pool. The ceremony was very nice and then the cocktail hour began. I handled 75 guests by myself just fine, though the line got long at times. I served spicy jalapeno margaritas, and a lot of vodka drinks. We ran out of vodka and bourbon toward the end and the wedding planner went and bought more. This coming weekend I am returning the Palm Springs to bartend a three day weddding event. Thursday is the rehearsal dinner, Friday the wedding, and then there is a pool party on Saturday. I will be bartending all three events, so it should be a fun weekend. Please follow us on Instagram if you haven’t already. On Saturday I bartended a 40th birthday party in Santa Monica as I am still recovering from a fractured rib. I took a friend to help me, and am grateful to have the help, but feel like I am recovered enough to do jobs myself now. It is amazing how quickly this has gotten better, because just a week ago, I couldn’t even drive a car. I realize I am not 100 percent yet, and I am only doing the events I already have scheduled for the next few weeks. The birthday party in Santa Monica took place on the courtyard of an apartment complex. Many apartment complexes around town have common areas or club houses where people can have parties. 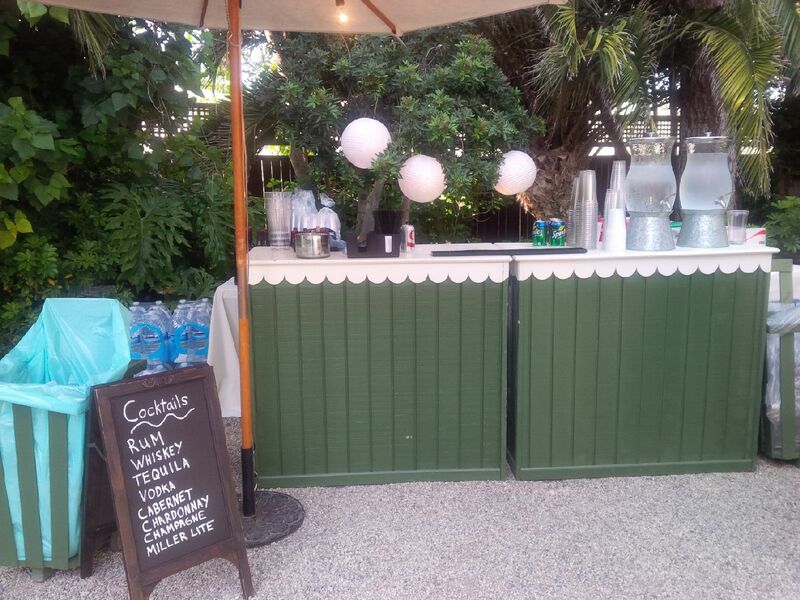 I set up my bar in one corner of the courtyard, and the caterer, Hampton’s Catering, set up his station right next to me. I made Moscow Mules, Old Fashioneds, Dirty martinis, and Margaritas for about 50 guests. The way I like to make margaritas now is by using tequila, organic fresh lime juice, and a shot of agave nectar. I rim the glass with salt, and I had many fans of this simple margarita. The classic Old Fashioned was the second most popular drink of the night. I think parties like this are so much nicer than meeting in a restaurant to celebrate. Even with caterer, bartender, and supplies, a person can put on a party like this for under $1000. What is $1000 when it comes to celebrating such an important milestone. Of course, you can go bigger and hire a DJ or even live entertainment. This weekend I believe I will be bartendting another 40th birthday party right here in Van Nuys, and then the following week I will be doing events in Orange County, and in Rolling Hills Estates. Hopefully by next month I will be back at 100 percent and fully recovered. Today is the first day I have felt like sitting at a desk and writing since returning from my trip from New Orleans and recovering from fractured ribs. I visited New Orleans for the first time last week and had an accident falling out of the hotel shower where I fractured my ribs. I returned to LA and have been laid up in severe pain this entire week – I finally feel much better today, but am not 100 percent. Shaken Not Stirred was very busy the week before I left on my trip, and I have even done a couple events since I’ve been back and haven’t written about any of them on this blog. The week before I left on my trip I did five big events. I bartended an alumni event in Burbank, did a bris celebration in Studio City, traveled to Indian Wells to bartend a rehearsal dinner for Goodfella’s Tacos, drove back to Castaic to bartend a graduation party, and then on Sunday bartended a Mother’s Day party in Woodland Hills. I left for New Orleans the next morning. That was one of my busiest weeks since I started the company. I went to New Orleans to attend the wedding of my friend, Jason Ricci. He is one of the best harmonica players in the world today. My accident happened on the day before the wedding. I was able to attend the wedding ceremony, but was in so much pain, had to leave shortly after and missed the big jam session at the famous Maple Leaf Bar where the wedding party was held. I was very disappointed about that. Despite my accident, I loved the city and people of New Orleans, and will return for sure. The food is incredible, and we Yankees could all learn a thing or two about Southern hospitality. The flight back was excruciating with broken ribs, and had not the nice lady sitting next to me given me a Vicodin, I can imagine the plane having to land in Nashville or somewhere because I was moaning so much. I returned on Thursday and had two upcoming gigs on Saturday and Sunday that I had no idea how I was going to complete. I could not bend down, turn my body, or lift anything above four pounds without wincing in pain. I called some other bartenders and tried to get somebody to take my gigs, but could not find anybody on short notice. I decided to get a friend to help me and I could sit on a stool and mix drinks. I will never cancel a gig I have taken a deposit for, and will to the best of my ability get the job done. My friend drove me to Fontana and we got the job done and I bartended a birthday party for 60 people. It was painful, but not as bad as I thought it would be. The next day we turned around and drove to Irvine to bartend a graduation party of 100 people. Once again, we got the job done, and I couldn’t have done it without my friend, Steve, who had no previous bartending experience. While we were doing that gig, I had three other bartenders doing a fundraiser event in Beverly Hills, which came off very well I have heard. I spend all of last week laying around letter my ribs heal. I went to the doctor and got xrays and at least three ribs are fractured. I have several events already scheduled for this month, but am not taking on any new ones until I am completely healed. Tonight I am bartending a birthday party in Santa Monica, and my friend is coming along to help me. Next week I am doing a birthday party close to home in Van Nuys. Hopefully, by next month I will be fully recovered and ready to roll for the summer party and wedding season. Last week was a very busy week for the LA mobile bartending service, Shaken Not Stirred, with five big events all in the Los Angeles Area. Two of the events were at the same residence in Pacific Palisades, there was a fundraiser in Sherman Oaks on Tuesday, a birthday party in Sylmar on Saturday, and then an open house at a store in Venice on Sunday. I think all of the events went well, but I was not operating at full capacity on three of them, because I think I got food poisoning somewhere along the way. On Monday I was sitting at home at around 5pm in Van Nuys when I got a call to do a bartending job in Pacific Palisades at 630pm. I told the guy I didn’t think I could make it in time. It was not somebody I had ever worked for before. He said, “Would it help you if I sent a car to come get you?” “Yes, that would help me,” I said. He arranged an Uber and within 15 minutes I in the backseat of a Lexus on my way to Pacific Palisades. I did the job, and they sent me home in a different Uber. I must say that spoiled me a bit. Ironically I had done another event at that same house for a different group of people before. 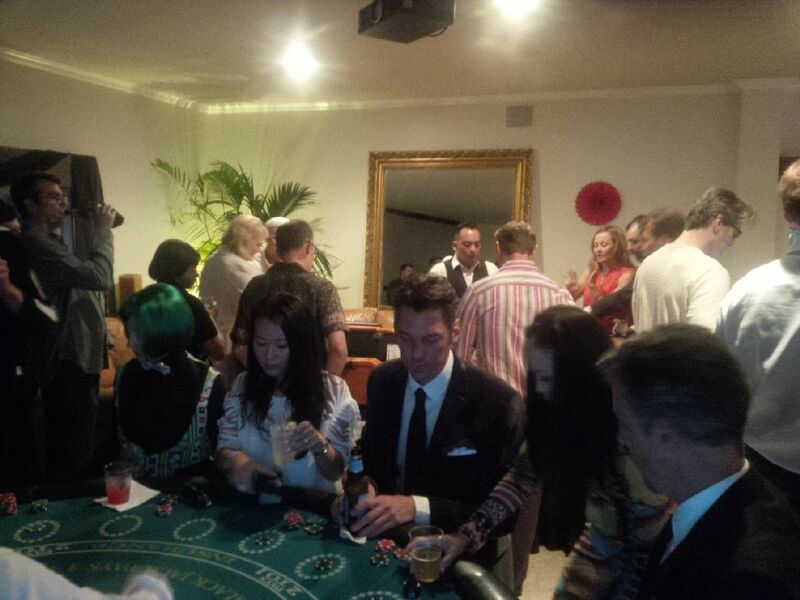 On Tuesday I returned to a house in Sherman Oaks to bartend a fundraiser for the City of Hope Chancellors Club. There were many dignitaries in attendance including the LA County Sheriff, Jim Mcdonnell, many superior court judges, and other political and business leaders from around Los Angeles. The Chancellor’s Club supports the City of Hope in its cancer research and sounds like a very worthwhile cause. I served a lot of wine and a few mixed drinks and the organizers of the event were very happy with me and said they would use me for future events in different parts of the city. The next day the guy from Pacific Palisades called me again. He offered me another job for Friday night at the same household. He didn’t offer the Uber again and I didn’t ask. It was not last minute. So on Friday I drove out there in my own car (imagine, the horror). I had time to kill in Santa Monica and was hungry. I was looking for a place to eat on the Third Street Promenade. I finally decided on a place with a nice patio and good guitar player performing on the street nearby. It was pricey and pretentious and I was irritated by the slow service. I am not one to usually complain, being in the service industry myself, so that tells you how bad it was. The food matched the mediocre service. I was thinking about writing a bad Yelp review, and a place has to be terrible before I will do that. Well, I went to do the second event in Pacific Palisades and it quickly became clear that something was wrong. I could barely get through the event, though I don’t think it was apparent to the guests I was serving. When I got home I was having fever and chills. I tossed and turned all night and was nauseous. The next day I felt horrible and knew I had to do a 70th birthday party in Sylmar that night and then have a quick turnaround and be in Venice for the store event in the morning. I tried to take it easy all day Saturday, but I had no appetite. I hoped that I could make it through the two events I had contracted to do. I showed up on time to the event in Sylmar and I pulled it off, though I must admit I was not operating at full capacity. The people that hired me have a catering company and they were so much help to me. They thought I did a great job, but I felt I could have done better. I was miserable operating on almost zero sleep and very little food. I got home at midnight with chills and fever again and set my alarm clock for seven the next morning. I had to be in Venice by nine. I made it to Venice on time and with coffee I was able to muster enough energy to pull the final job of the week off. The store Christy Dawn is a specialty vintage inspired dress shop and they were holding a promotion where they had matching dresses for mothers and daughters. I served mimosas and Kombucha. It was a very mellow event which was about all I could handle. The owners were super nice people and they started their business in their garage and are now having great success both online and in their storefront. This weekend is Halloween weekend and the LA mobile bartending service will transition into Orange County to do a Halloween Party in the City of Orange on Saturday night, and then a reunion in Laguna Beach on Sunday. November is looking to be very busy, as there are many corporate weekday events already scheduled. Shaken Not Stirred closed out the month of May with five big special events throughout Southern California this week. I am dog tired and sore as I write this, as I served literally hundreds of drinks in the past few days – maybe even thousands. Yesterday alone I served four cases of tequila and a case of whiskey. Today is Memorial Day and I am taking it easy, but if somebody calls me last minute I will probably put on my bartender cape. The first event of the week was a corporate event in Brea. I am not sure what the occasion was, but we served drinks to 200 people in the back lot of the company headquarters. We used the drink dispensers to pour margaritas, which saves alot of time. Two bartenders are needed to serve 200 people. Mariachi Sabor De Mi Tierra provided the mariachis. They had a three different food trucks serving up the food.My associate, Mia Martini helped me out, and we worked well together as always. The following night I traveled to El Segundo to help Mia Martini with one of her gigs. Once again it was a corporate event on a weeknight (I love those). The company that hosted the event was a 3D printing company that manufactures parts for the aerospace industry. Their equipment is quite fascinating and I’m sure this company has a bright future. The caterer did not show up and when the host called him, he apparently had the date wrong. The hosts scrambled and ordered pizzas and a local El Segundo restaurant stepped up and delivered 50 pizzas and salads within an hour. This is one of my worst nightmares that I mix up a date and miss an event. That isa why I always confirm a week in advance, and again the day before. On Saturday night my son and I bartended a wedding at the historic Alexandria Ballroom in downtown LA. The ballroom has hosted presidents and dignitaries like Winston Churchill in the past. Once again, we were serving 200 people. The plan was to have a whole bunch of drinks already poured so the people could just grab them when they came out of the wedding ceremony. I poured a bunch of red wines and was waiting to start pouring the cold drinks until fifteen minutes before the end of the ceremony. Well, the ceremony ended 20 minutes early and we were faced with a wall of people wanting drinks. We handled it. Maxim Restaurant provided the catering and they had many delicious Russian specialties. On Sunday afternoon, I traveled to my old stomping grounds in Palos Verdes Estates to pour wine for Jaques at Le Rive Gauche. He put out a spread of appetizers and charged people $20 a head to taste several French wines. It was a great deal and I think all of the people attending certainly got their money’s worth. He had two red Bordeaux, a white Bordeaux, a Grenache, a Champagne, and two Cotes Du Rhone reds. The Grenache, a rose wine seemed create the most attention. I had to quickly transition from the wine tasting and hustle over to Santa Monica to bartend a wrap party. I had to buy the ice and supplies and deliver it to the house where the party was taking place. The house was on PCH and had a weird address. The GPS kept directing me to this parking lot by the beach. If I left that parking lot, it took me twenty minutes to turn around and go back on PCH. I was a few minutes late and had to pack all the supplies around the back of the house through the sand. I barely had gotten setup when guests started arriving. I served 120 people by myself for five hours straight. I was so busy I didn’t have time to ask the name of film that they were wrapping or what is is about. Needless to say, I am tired today after five special events in one week..
Next weekend I will be bartending a birthday party in Stevenson Ranch on Friday, and then have a wedding party in Eagle Rock on Saturday, and my son will be doing a wedding party by himself in Sierra Madre also on that day. Shaken Not Stirred, the Los Angeles bartending service, was present for four different events this past weekend. This was a record for Rob Neighbors, veteran event bartender for three days. He was official bartender at a wedding in Camarillo on Friday, set up bar in Bel Aire and Manhattan Beach on Saturday, and then attended a champagne tasting on Sunday. 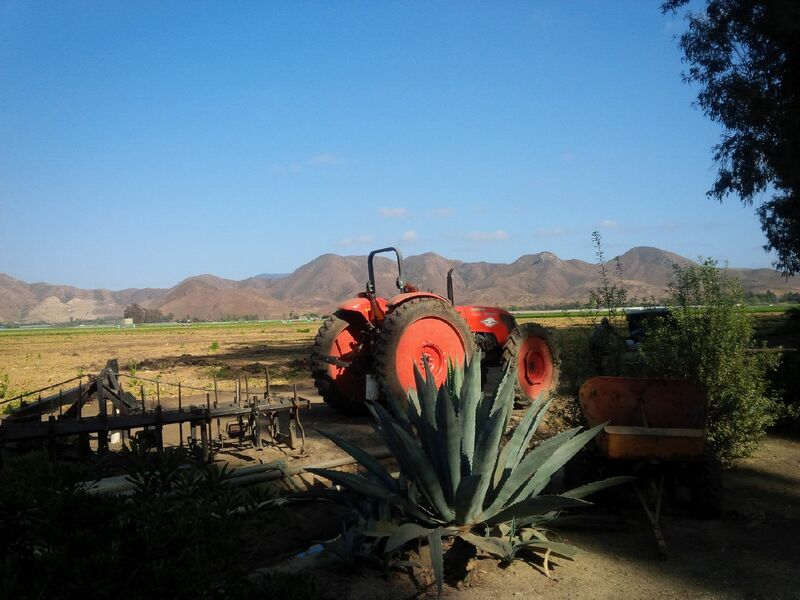 First of all, Friday, Shaken Not Stirred traveled to Camarillo to the McCormick Ranch to bartend a wedding. This was my second time at this venue, and it was a pleasure both times. I highly recommend this venue in Ventura County. It is a just an excellent, peaceful, and beautiful place for a wedding. The people who hired me couldn’t have been nicer. The groom was helping organize thing minutes before the ceremony. Not one person involved in the wedding seemed to be the least bit stressed, and that carried over – everything went as planned. The couple was married successfully, and I predict a great future for them, because both the bride and groom were so humble and quality people, which reflects on their parents. By the way, the parents were all there and were all fantastic people in my opinion. As I was preparing for the wedding in Camarillo, I got a call from my Yelp site. 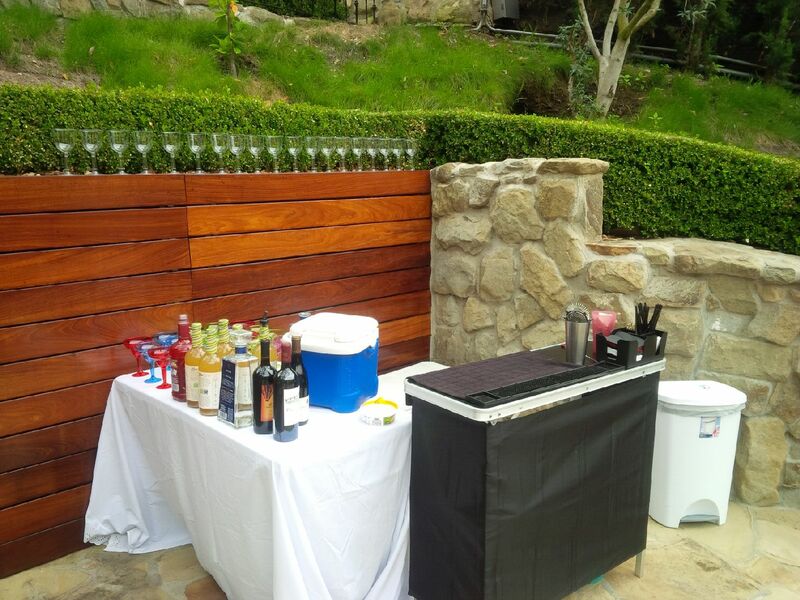 A host in Bel Aire needed an emergency bartender for a daytime party. I decided I could do the event before I had to be in Manhattan Beach at 6pm. It was a children’s party in Bel Aire, complete with face painters, petting zoo, balloon makers, authentic soul food caterer, and me, the bartender. I made margaritas and poured wine, as the kids played and enjoyed the various amusements. I’m glad I took the event and hope to work for these clients again. Saturday Night I worked a Las Vegas themed 50th birthday party in Manhattan Beach. I had made some specialty drinks for the party that we planned in advance. I made “Sweet Heat,” which is a spicy vodka drink, that is hard to explain, but I would say it is a vodka margarita. People really liked it. They had a craps table and a blackjack table on hand and I think people really had a good time. The house actually looked like a real casino, and the guests were dressed accordingly. 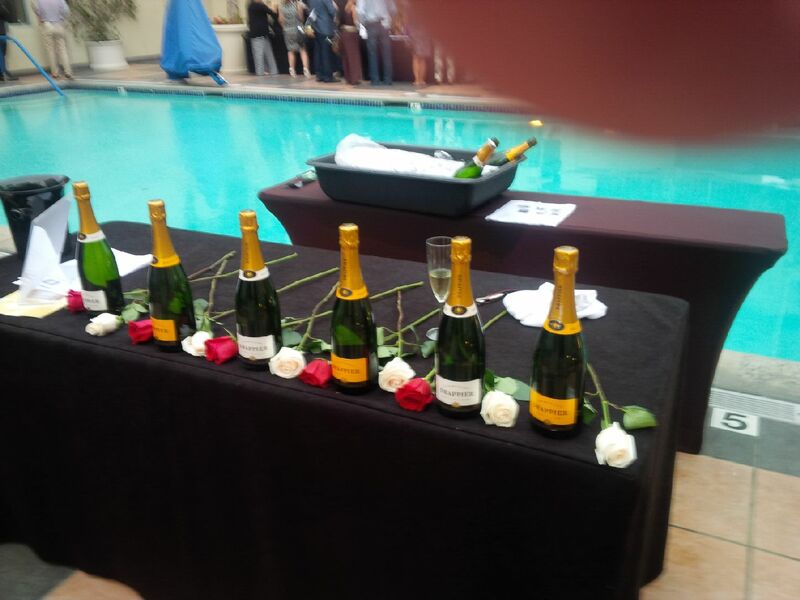 Sunday night, I rounded out the weekend by doing a champagne tasting at the Le Merigot Hotel in Santa Monica. I served a lesser known, but very established French Champagne, which was rumored to be the favorite champagne of Charles De Galle. I had a blast talking to people and serving the champagne. A long line formed as people waited to get to the Cristal Champagne table. I talked to literally hundreds of people and they were mostly very impressed by the champagne I was serving. As a bonus, I got to keep several bottles of very nice champagne, which I plan on serving at my book signing. Another great weekend for Shaken Not Stirred. On Wednesday, I am back to Beverly Hills for a cocktail hour for one of my best clients. On Saturday, I will travel to Chino Hills to bartend for a birthday party. Shaken Not Stirred is the Los Angeles bartending service on the scene.